From “Elegant Selection of Six Flowers (Six Immortal Poets)” In this series Eishi depicts the classical poets as modern beauties and assigns a blossom to each of them. On the right, over the beauty posing as Ono no Komachi, the title of the series is printed on the bottom-most playing card, with the name of the poet and one of her waka poems from the classical anthology Hyakunin-isshu (“One Hundred Poems by 100 Poets”) on the top-most one. Eishi designed only a very few half-figure portraits of bijin in the style of this perfectly printed masterpiece. Teruji Yoshida in his note on the series supposes that Eishi intended to portray each of the Six Immortal Poets as a courtesan holding a different flower. This is the only design in the series which is known, and it is likely that the set was never completed. 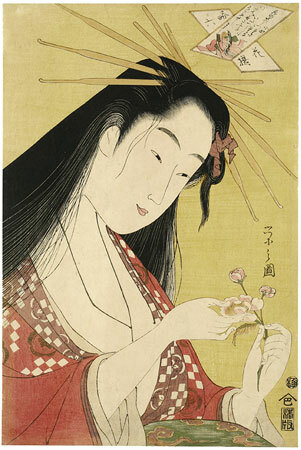 Unlike Eiri, Eishō, and Chōki, Eishi designed very few half-length portraits of beauties. Among them, this design is certainly a masterpiece, and this impression with its unworn outlines and brilliant unfaded colour, is the finest impression, by far, known to have survived. Yatsushi, the first character in the title means “abbreviated” in modern Japanese, but in the Edo Period it meant to dress up, to change one’s appearance, to resemble in an allusive or far-fetched way. Here a modern beauty has her hair draped around her shoulders like the Heian poetess and contemplates a cherry blossom which is the subject of Komachi’s famous poem in this miniature anthology. The cartouche is inscribed on one of a pair of playing cards for a game of the 100 poets, the other side of which show a vignette of the poetess, her poem and her name. Other impression of this print are reproduced in Henri Vever (Sotheby’s, London, 26 March 1974, no. 236) and Kinbei Murata (Tōkyō, April 1932, no. 125). and watch the summer rain.